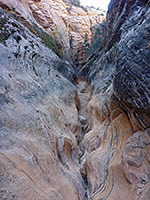 Bitter Creek is a minor, usually dry drainage in the Pine Valley Mountains of southwest Utah, cutting through bushy, partly wooded slopes for 5 miles before joining the slightly larger Cottonwood Creek, which downstream meets Quail Creek shortly before this stream is impounded to form a reservoir. 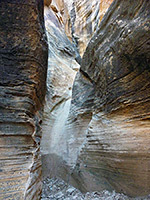 One short section near the lower end of Bitter Creek is deep and enclosed - a slot canyon, extending just a quarter of a mile but still containing some photogenic passageways, interspersed by chokestones and dryfalls. 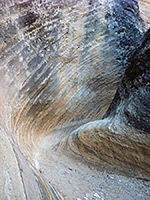 The location is probably not worth a special visit, but could be explored together with other sites in the vicinity including the banded formations of the Yant Flat Cliffs, the longer slot of Yankee Doodle Hollow, and the watery narrows of Red Cliffs Recreation Area. 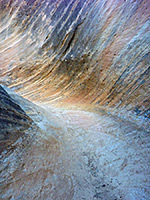 The middle slopes of the Pine Valley Mountains coincide with the far western edge of the Colorado Plateau, and are formed of grey and red Navajo sandstone. Bitter Creek is mostly enclosed by the grey rocks, which are replaced by the red layer around the junction with Cottonwood Creek, one mile downstream from the slot. 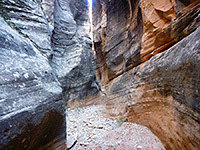 Hence the slot passages are rather gloomy, the walls often stained darker grey, and the angle of the passageways means that the sun rarely illuminates the canyon floor. 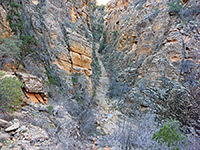 Bitter Creek is accessed by Road FR031, which crosses the drainage 11.5 miles west of Leeds, and less than one mile from the parking area/trailhead on Yant Flat, after which the road deteriorates somewhat, becoming rutted and narrower. The track continues west to an alternative start point near St George, but part of this section may require a 4WD vehicle. A little stream often flows in the vicinity of the road crossing, but the waters soon sink below ground. 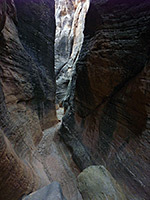 The verge by the crossing is the place to park if the descending all through the narrows, though rappelling is required in a couple of places, but most of the slot can be seen without equipment if entering in from the lower end, and for that there are several other parking areas, a little way back east along the road. 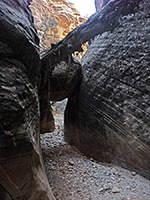 If following Bitter Creek downstream from the road crossing, the initial section is often marshy due to the flowing stream, but the waters usually dry up just after a boulder and pool. Not far beyond this is an unclimbable fall, the first point where notes are needed to continue. 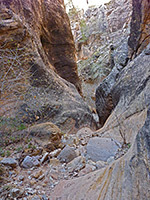 The canyon is not yet very deep so it is easy to climb back to the rim, and walk along the canyon edge for a quarter of a mile, to a steep, east-side tributary ravine, which provides a quick route back down, descending 240 feet and joining the canyon just downstream of the end of the slot. Downstream of the junction with the tributary ravine are a couple of nice, moderately enclosed passages, before Bitter Creek widens and later joins Cottonwood Creek, but the best narrows are upstream, and they are blocked at intervals by falls and chokestones, requiring not too difficult upclimbing, and eventually by a taller drop, not easily climbable, but this is now nearly at upper end of the slot. 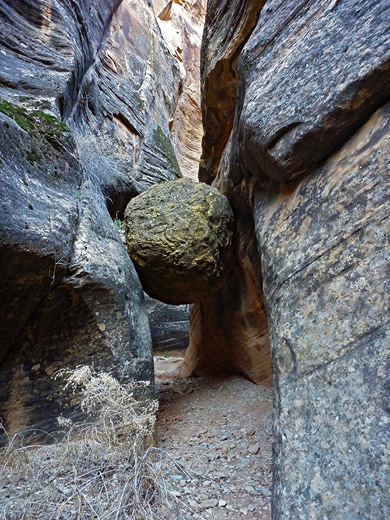 One chokestone is a neat, spherical, greenish boulder, trapped at head height in a pretty section of the canyon. 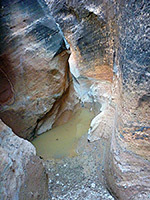 Some parts of the slot are flooded to depths of 2 or 3 feet following wet weather. 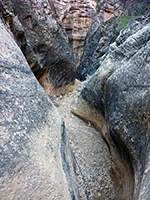 The sandy parts of the canyon floor usually have a fair few footprints, so the canyon seems relatively well-known, despite its rather remote location, and short length.